(Excerpt from Goodreads) Hours after hiring Mac McClellan to investigate the supposed suicide of her archaeologist brother, single-mom Jessie dies in a car accident. Jessie had just showed Mac artifacts and a copy of a map Jake found, items that indicate Hernando de Soto and his explorers might have camped on Five Mile Island during the winter of 1539-1540. Studying the map, Mac determines the site lies in the middle of a planned resort, The Dunes. Declaring the area an historic site could shut the project down. Suspicions aroused, he forges ahead, even though he no longer has a paying client. An archaeologist, Jake has been found dead, the police rule it a suicide but his sister, Jessie knows better. Because he was looking for Hearnando de Soto had camped in the same area he was investigating, Jessie knows that it was murder. She calls Mac in to investigate. Mac discovers that a resort is planned on being built in the same area. There are a lot of suspects that seem to have something to gain from this resort. But when they decide to try and take out Mac, things get very personal. This is Mac’s first official case as a private investigator. But this case is no so cut and dry. Because Jake had some mental health issues the suicide seems to be closer to the truth, but the more Mac digs the more it looks like someone is trying to hide something. Then they target him and things get really exciting. This is a great mystery. I didn’t know who did it until the end because there are a lot of potential killers for many different reasons. There is a lot of action and you can’t help but liking Mac. Mac is a true down home hero. I couldn’t put this book down until the wee hours of the morning. 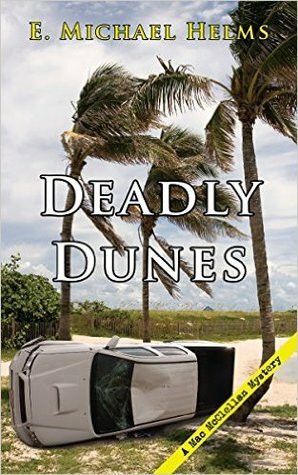 I f you are looking for a great mystery full of thrills and chills I recommend you check out Deadly Dunes. As for me, I’m going to find the first two books in the series and find out more about Mac. To purchase The Deadly Dunes make sure to check out Amazon, Barnes and Noble, Goodreads, and E. Michael Helms website. I received Deadly Dunes for free from the publisher in exchange for an honest review. Thank you very much for hosting the DEADLY DUNES tour, and for your wonderful review — very much appreciated!